It’s been more than a month since we set our resolutions and in this stretch of striving to continue without breaking them, goal-setting becomes even more of a trending topic than usual. If you’re someone who hates not meeting goals, maybe you make the mistake of setting the bar too low. Maybe you get overly ambitious and challenge yourself by setting unattainable goals. The key to success here is by being realistic, and being…(dare I say it?) SMART. By making sure that your goals meet all of the SMART criteria, (Specific, Measured, Achievable, Realistic, Timely) you ensure that you are setting yourself up for success with checkpoints that allow you to take a second look and reevaluate. Physically writing down your goal and visualizing it is a positive way to hold yourself accountable and makes you more likely to see your goal all the way through to completion. Plan fun rewards for when you hit your goals, make an inspiration corkboard to hang in your room and visualize yourself achieving and succeeding! Print the attached download and hang on your fridge, keep on your desk or tuck into your LifePlanner™ as a reminder of what to remember in goal-setting! CLICK HERE TO DOWNLOAD YOUR SMART CARD! UP, UP & AWAY: CELEBRATING OUR 10 YEAR ANNIVERSARY! We filmed in our Los Angeles warehouse, putting up a green screen and bringing in the LARGEST balloons I have ever seen! There were outfit changes, a huge fan to make that natural windblown look (ha! look out Beyonce!) and “movie magic” all done in post production to make it look like I was being carried away into the sky! My team had fun with their solo balloon shots too. At the end of the shoot, my team surprised me with a HUGE and adorable cake. I must say, our 10 year anniversary was pretty sweet! 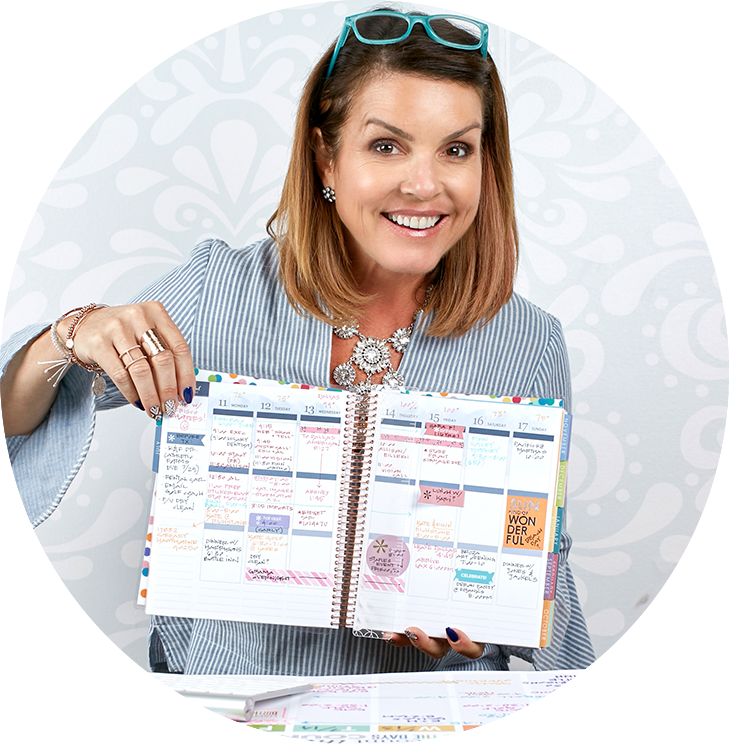 I hope you enjoy the the behind the scenes peek as we celebrate a decade of happy organization & inspiration. Click here to see our Newsletter with the final images! Putting the FUN in Fundraising: Mom’s Night Out! It seems like we get less and less state funding for our schools these days unless we decide to raise it ourselves. Our sweet little public school really needs all the help it can get and thankfully we have an incredible group of volunteers that organize events to make money for our education foundation. Our Mom’s Night Out at the Comedy Club in Hermosa Beach all started when one of my friends thought we could have some FUN while fundraising and now it has become one of my favorite school events of the year! My company sponsored the event this year by providing stickers & “swag” for all the guests, and sooo many other generous local businesses donated amazing items to the gift bags that were raffled off before the comics took the stage. I must say, we made our own comedy on stage as I felt a bit like Vanna White showcasing all the prizes! The event was sold out and brought in more than $10K for our school! Way to go MOMS! Posted in EVENTS + ON THE GO!